Why is Corporate Touch the choice for chair massage? Staff and experience: We personally train superb Massage Therapists in chair massage. 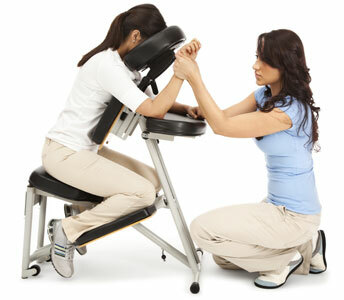 We have over 30 years experience in providing and refining chair massage. Our large staff assures reliable, professional service. We can expertly set up a single day special event or an ongoing program. We are the chair massage providers for Santa Barbara's largest employers as well as small offices. Our many satisfied clients know us for how simple and effortless we make it to have a chair massage program or event. We are committed to superb customer service, excellent communication with client companies, high professional standards, and improved health and productivity for employees.